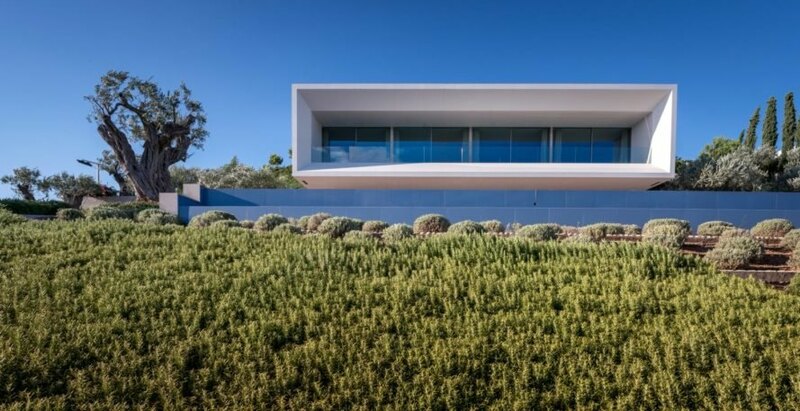 Tucked into a sloping hillside looking out over the Aegean Sea, the TRIF House designed by Sergey Fedotov boasts a gorgeous, contemporary design with massive floor-to-ceiling sliding windows to take in the breathtaking sea views. In addition to its striking aesthetic, the private residence also includes a number of passive features that insulate the home and reduce energy use throughout the year. 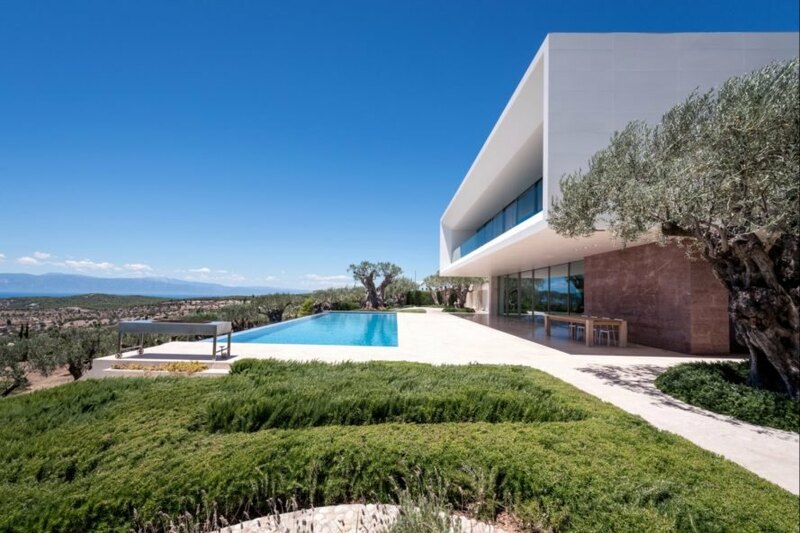 Located in Porto Heli, Greece, the massive home, which spans over 3,800 square feet, sits on a naturally sloped landscape spotted with olive trees. 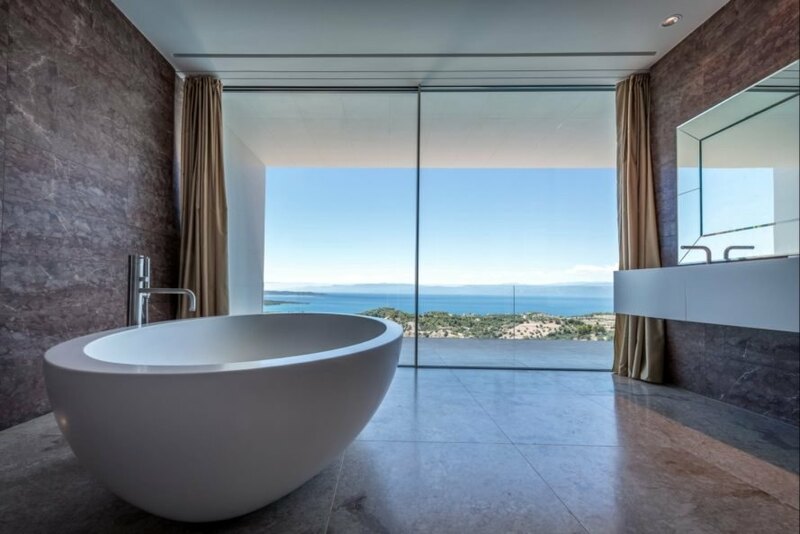 To appreciate the gorgeous sea views, the front facade is a series of frameless, floor-to-ceiling windows that can slide open and shut at just the push of a button. 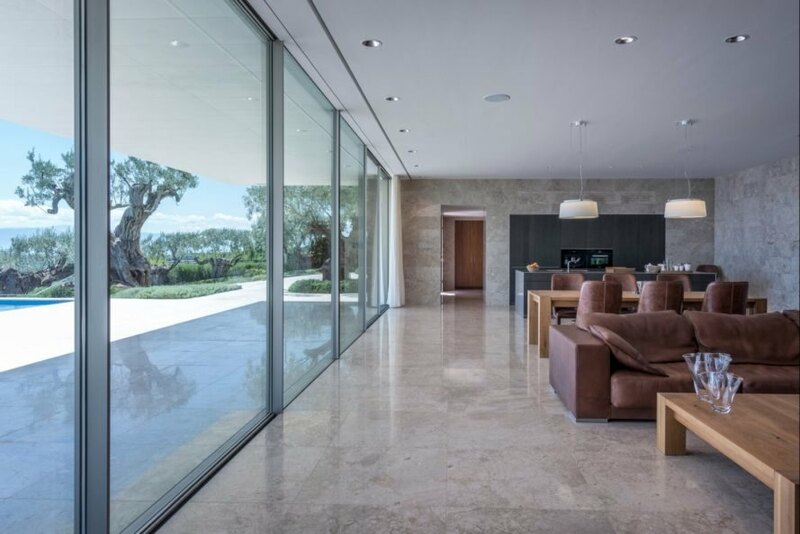 The glazed exterior not only creates a seamless connection between indoors and out but also allows for natural sunlight to illuminate the interior. Alternatively, the home’s north facade was embedded into the natural slope of the hillside. Burying part of the house into the landscape was another passive feature that helps provide the structure with a strong thermal envelope. The main floor houses a kitchen, dining and living room, all of which open up to an expansive veranda with a swimming pool. The top floor, which is enclosed in a large white rectangular volume that cantilevers just slightly over the ground floor, is home to the master bedroom and two guest rooms, all of which enjoy stunning panoramic views. 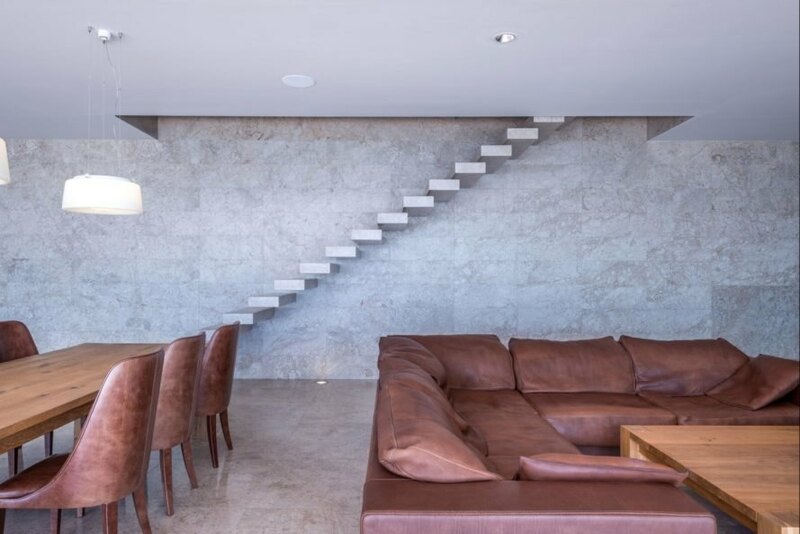 The interior boasts a minimalist design with custom-made furniture. Surrounding the home, the landscape was left in a natural state. Large olive trees and shrubs dot the sloping hillside, which has various walking paths that wind through the home’s beautiful surroundings. The TRIF House was designed by Sergey Fedotov. The landscape was left in its natural state. The modern home was built carefully into the landscape. 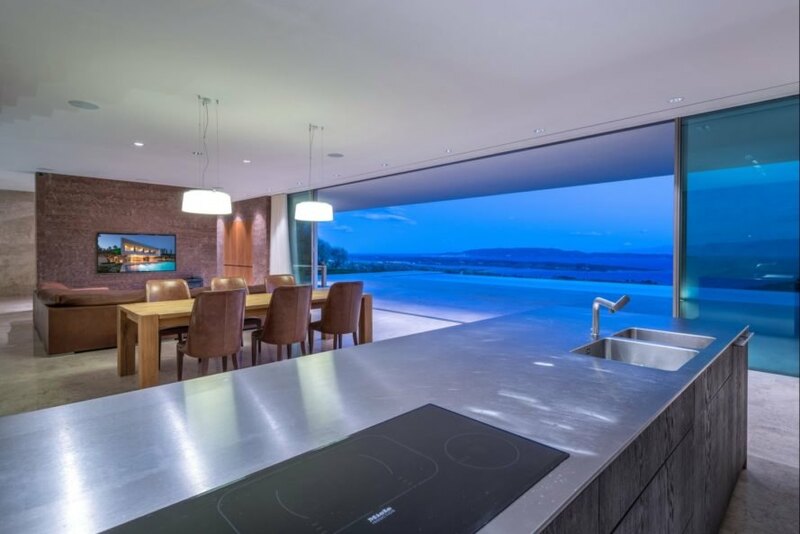 The front facade has large floor-to-ceiling windows that provide stunning views. The electric window system slides open and closed at the touch of a button. A series of frameless sliding windows connect the interior with the outside. The home has a number of passive features to keep it energy-efficient. The interior design is minimal to put the focus on the stunning views. Sparse furnishings were used in the interior design. The home's main living space can be completely opened to the outdoors. Every room in the home has picturesque views. Smooth concrete flooring was used for the veranda. The top floor houses the master bedroom and guest rooms. 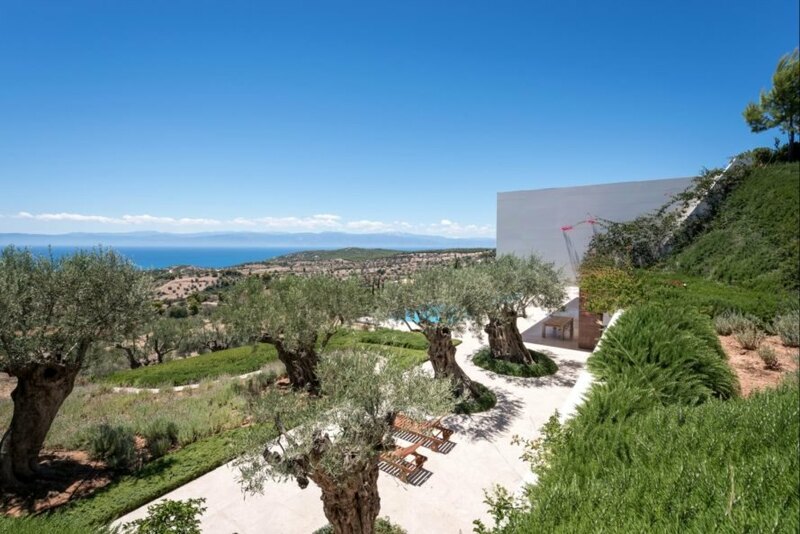 The home's natural landscape is dotted with olive trees. Several winding paths stretch around the home. The home was tucked into a natural hillside facing the sea.